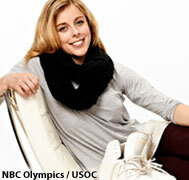 Olympic figure skater Ashley Wagner is in Sochi, Russia, right now, prepping for the biggest competition of her life. Before she left, we got a chance to chat with her about her future aspirations — as a sports journalist. I used to [have a video] blog, and that was really fun for me. I would take the camera and show people around backstage, show what it was like, you know, walking back to the competitor’s lounge, or what it was like getting rehab done on an injury. So I tried to show the different aspects of skating, beyond those perfect couple of minutes that you see on the ice. It just comes kind of naturally to me to take something and try and make it relatable and interesting to someone who doesn’t know everything about skating. So I think that [the editors] saw that and thought, ‘Hey, she’s not too shabby at this. Why doesn’t she try blogging for us?’ And it took off from there. For SI.com, I’m mostly just giving people a glimpse of what it’s like on this crazy journey to Sochi. I mean because there are so many different aspects of competing and preparing and designing even that go on in figure skating, I wanted to give people a little insight into that. For more from Wagner, including how she handles nasty criticism on social media, read: Olympic Figure Skater Ashley Wagner On A Possible Future in Journalism.